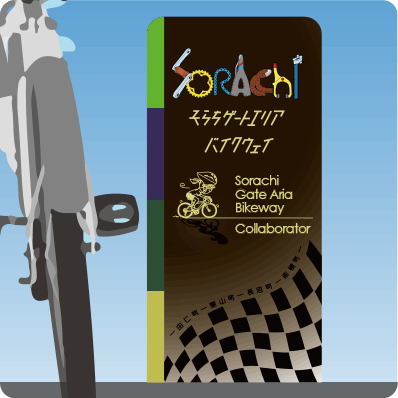 What is the Sorachi Gate Area Bikeway? The Sorachi Gate Area is comprised of four towns, Yuni, Kuriyama, Naganuma and Nanporo, all of which are accessible within 40 minutes from downtown Sapporo, and 30 minutes from New Chitose Airport. It is an area rich with pastoral landscapes that spread across Sorachi area, and is also an attractive area if you are interested in fresh gourmet foods. We call the bicycle path that connects a web of public and farm roads which offer beautiful scenery along the way, the "Bikeway." The cycling course is not made up of just roads that cars drive on, or which are indicated by car navigation systems. The Bikeway will take you on roads less traveled, quiet and tranquil country roads that have supported the development of agriculture in the Sorachi Gate Area. Wayfinding involves orienting one's self, and finding his/her way through unfamiliar territory, even if it means you get lost occasionally, by using scenery, buildings or other landmarks that somehow leave an impression on you. We have created an illustrative map that indicates spots within the area that will stand out, and leave an impression on cyclists. Check your map to see where buildings are, and where one road leads to another, and get a feel for the lay of the area for the four towns. Each cyclist should build his/her own route or plan based on the illustrations in the map. We used Google Maps to determine and show precise distances omitted in the illustrated map. You can enjoy riding actual roads as if you are in a role-playing game. We hope you will come every weekend and create tons of your very own cycling routes! We also hope that you will use this opportunity to discover the many aspects of the four areas you never knew existed. Once you enter this area, you will find that many stores support and encourage cyclists, and you will find "road support signs," that correspond to both the illustrative and Google maps, which makes it a very convenient area in which to ride. Inside the four areas of the Sorachi Gate Area, there are participating stores with signs, as shown in the photo. Besides distributing illustrative maps, these stores support cyclists and strive to make their journeys pleasant, by offering various campaigns and discounts. Depending on the store, cycle racks are provided. Gas stations throughout Yuni are equipped with bicycle floor pumps, simple tools, and spare tubes to aid in any minor repairs cyclists may have. As you ride the country and town roads through the beautiful countryside, the continual flat scenery that goes on forever can become monotonous, and cyclists can lose their sense of direction. For this reason, cyclists used to avoid riding on new and uncharted roads. 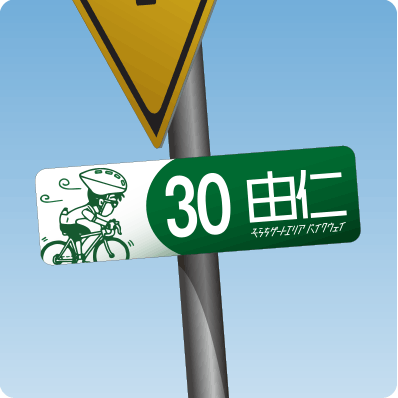 However, the Sorachi Gate Area Bikeway, by incorporating the use of the illustrative map, and Google map, with street numbers entered into settings, uses GPS to help cyclists find their way. It also provides information such as where to find great roads nearby, using color coding. Use the Good Bikeway, Tour Bikeway, Friendly Bikeway, Gravel Bikeway lines to discover and chart your very own adventure!